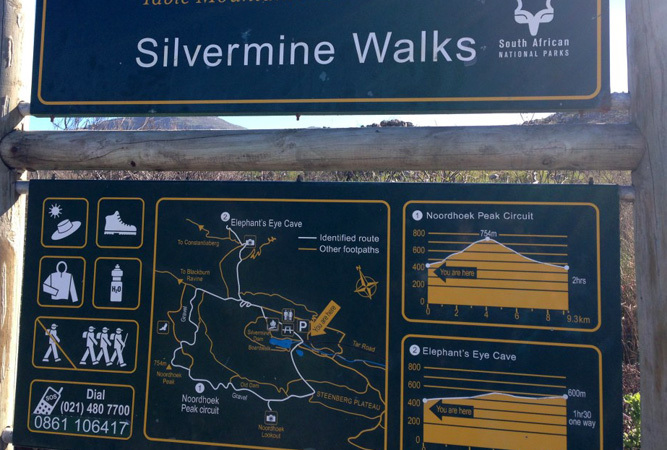 Silvermine, which forms part of the Table Mountain National Park with its entrance gate at the top of Ou Kaapse Weg about 20 minutes’ outside of Cape Town’s centre, is a magnet over weekends for families. People settle on the banks of the dam along which there are pretty, shady picnic spots, whilst hikers set off on various gentle walks that seldom tax but fulfil the very necessary contact with nature we all crave. If arduous is your thing, you can take on the walk up the back of Table Mountain from Silvermine, which adds up to a full day’s hiking, or you can take to the hills on your mountain bike, as some did this past weekend, which I’m sure provides a hefty surge of endorphines given the speed at which the group came flying down the hill past us – the monster munch was taking notes! We battled our way past the reeded Hoerikwaggo Trail campsite through an already overflowing parking lot, and launched ourselves up the hill with a myriad other parties intent on similar (Silvermine is a popular choice over a weekend, so the earlier you get there, the better, particularly if it’s a picnic spot you’re after). It was a perfect day for it. 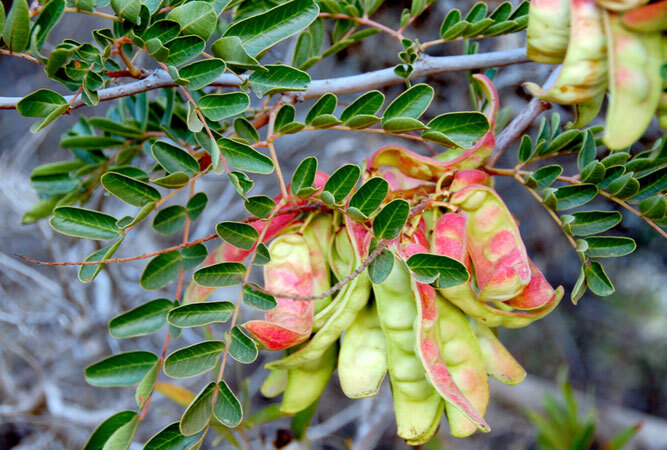 The fynbos was in full swing, sun birds by the dozen, ericas and heathers in full bloom on the sides of the mountains – where water drainage is better, I believe, than in our front garden where an ongoing battle to keep a particular erica bush alive long enough to flower ensues(!) – and very little wind. Most of the walk is along well-hewn paths and gravel roads, which makes it fairly easy going, give or take the odd over-achiever who makes doing the route double-time their goal for the morning! 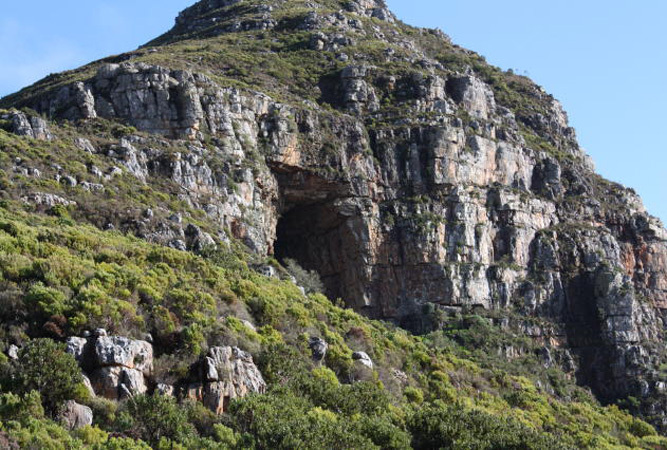 The views are pretty spectacular the higher you get, but the biggest surprise is getting over the hill to the Tokai forest side, and looking out across the False Bay Coast from there – right across the flats all the way to the Hottentot Holland Mountains. Just when you thought that the views couldn’t get more picture-card perfect, one heads up the Elephant towards the eye, and the scenery gets better still. The Elephant’s Head was alive with ericas and the pink against the vivid green of the fynbos and the blue of the skies was breathtaking. At least it was a handy excuse to catch my breath on the way up the final leg, together with an attempt to find our house in the valley spread out below us! The cave itself is huge – a great slash in the wall of the mountain with an even smaller mini cave towards the back end of the cave. There were only a few groups of people mingling around the cave when we finally got there, including a dachshund (apparently if you have a Wild card you can take your dogs as well). Some people attempt the walk from the Tokai manor house in Tokai forest, although that version of the walk looks particularly strenuous as you’re going at it uphill most of the way. The advantage of this route would be that during summer at least the initial two thirds of the walk is under canopies of trees. It’s just one more reminder of how spoilt we are in Cape Town for beautiful moments and outdoor activities moments from your door. The hike is awesome!!!!! People of SA TRY IT!!!!!!! Thank you for this – haven’t tried this one, will give it a go!